I have been getting interested in birds lately. That is, I've been looking at a Birds of Wisconsin guide so that I know what I'm looking at when they land outside my porch as I sit there enjoying a beer. 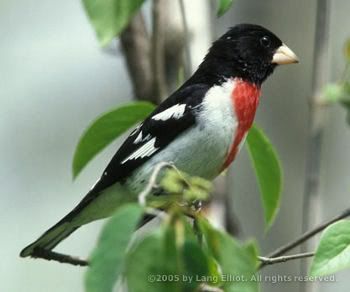 That's the Rose-breasted Grosbeak. The guide says that they are to be found throughout Wisconsin during the summer and are migrate here late in the spring. Now, I saw it in mid-April which, to my mind, is about a month away from late spring. Perhaps an early comer? In addition to birds, my neighborhood is home to the usual armies of gray squirrels but I've noticed a blonde one scurrying about as well. We're also infested with rabbits, much to this would-be tomato farmer's chagrin. Lastly, a family of raccoons took up residence in a storm drain kitty-corner from my house but, with all this rain, they've no doubt sought a drier home.